The amazing reviews just keep coming! Something exciting and new in the Tower Defense genre! The geometric vector creeps are fast and intense. With 30 different maps, each its own puzzle, you'll have to work fast to keep up. geoDefense is a Thinking Man’s Action Tower Defense. 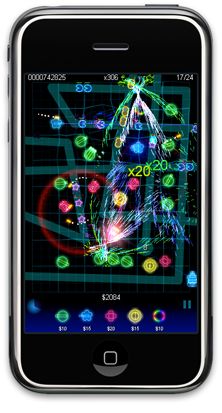 Though the controls are familiar, the gameplay is decidedly different: You have to develop a strategy and, at the same time, execute in real-time when things are moving fast. Think of it like Chess. There is your opening moves, which are setting the stage for how you will win the level. The middle game is where you do your busy work of getting built-up for the final push at the end. The end game is where it gets completely crazy! If you didn’t have a strategy up until this point, no amount of fast fingers will save you. Sounds hard? It is... be very rewarding when you win! And every level is beatable.... there are the quick, and there are the dead. Which are you?